When I bought my SDL last year the temperature hovered around 100 C. After I replaced the head, it got a little better and stayed around 95 C, but would climb to 100 C during acceleration or climbing hills. I did what was recommended by many of you--refilled the viscous clutch with silicon, replaced every temp sensor I could find, checked the aux fan (replaced the resistor), and replaced the thermostat. This seemed to help a little but still wasn’t where I would like it. Now the confession part. I also was dealing with a small coolant leak from the left side of the engine block. Couldn’t really tell where it was coming from so I added some Bar’s leak aluminum stop leak. (You’re probably asking “didn’t he read all those threads). The next day the temp started to rise above 100 C and I had to use the defroster to prevent temps in excess of 110 C. Suspecting I plugged a fairly new radiator, I did the hand test, and sure enough, noticed a big cool spot dead center of the radiator right in front of the viscous fan. I flushed the system several times with water and replaced the Zerox antifreeze. No help. Temp still too high. After a cold one, I decided to try a new radiator. Went to my local parts dealer a purchased a new OEM radiator (ouch!). What a difference! The temp now stays around 85 C. With a/c on full, and accelerating up a hill the temp never exceeds 90 C. I think I finally solved the temp problem. 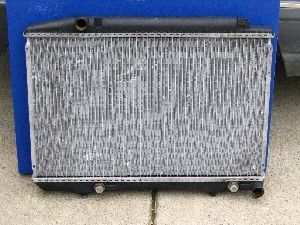 The PO replaced the radiator a few months before I purchased the car so I never suspected that it may be part of the problem. I believe that the radiator was partially blocked when I bought it, and I finished it off with the stop leak. Prior to replacing the radiator, I also investigated the coolant leak from underneath the car. It appears that the leak is from a small crack in the block at one of the head bolt cavities. I cleaned up the area and covered it well with a steel like automotive epoxy. This seems to be working. It has been completely dry for several days and even made it through the few days that my temp was exceeding 100 C. Time will tell. I know there is a short block somewhere in my future. But I would like to get a few more years out of the current one. Now for the main reason of this posting. I now have a fairly new Bahr radiator (part number ??) that I suspect is partially blocked. I don’t know if it can be cleaned or re-cored, but I suspect that someone more knowledgeable than I might be able to salvage it. I was thinking of placing it on ebay if it has any value. So I have two questions. What do you think its worth and is anybody interested? It looks new except for some slightly bent fins here and there caused by a broken fan shroud. I’ve included a few pictures. I also want to thank everyone who contributes to this forum. The information here is invaluable to any MB diesel enthusiast. My 300 SDL is running great now. There is probably not a system that I haven’t repaired on this car. In every case, I can count on numerous threads to help me along. Special thanks goes to those that are regular contributors such as: Brian Carlton, gsxr, Hatterasguy, TimFreeh, 82-300td, jhal, RunningTooHot, and many others. I couldn’t own this car if it wasn’t for them. 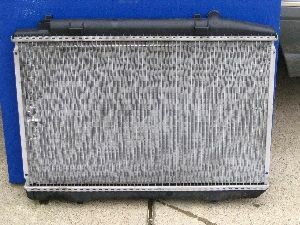 Take the plugged radiator to a radiator shop, they may be able to fix it. "covered it well with a steel like automotive epoxy." If that does not fix it.... depending on where the leak is... try taking all the stuff you put on it off... and using the ( JBWeld ?) to hold on a patch... this means that instead of relying on the strength per unit of the Epoxy...that you multiply it by a thousand by spreading it out over a wider area... one inch on each side of the break is my rule...and 1/8th inch thickness of the epoxy minumum.